Apple’s iPhone 8 release date may have been delayed but new rumors are still surrounding the Internet. On Wednesday another possible iPhone 8 feature hinted by a leaked image indicating the wireless charging feature in iPhone 8 edition. 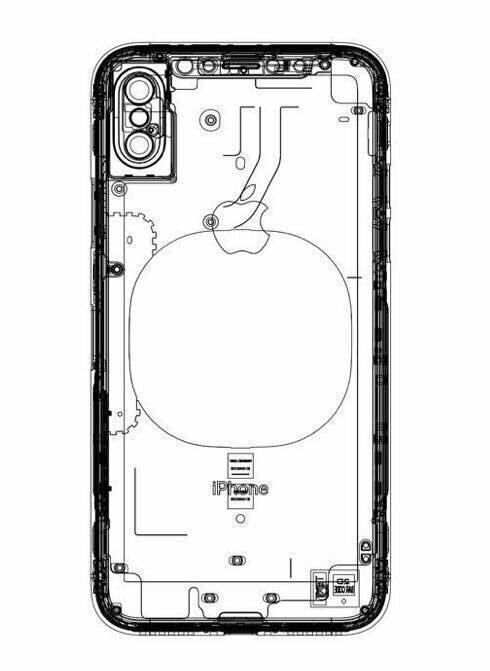 The above leaked schematic diagram of possible iPhone 8 was posted on Twitter by OnLeaks. The source of the leaked iPhone 8 schematic is not revealed by OnLeaks but, it has given us the idea that Apple Inc. is now closer than ever to launch its first ever wireless charging device. If you analyze the schematic closely you will notice a rounded surface at the back of iPhone 8. It’s the conductive surface outside part of the device – which will be the charging surface. You can also notice the 2 camera one we believe is 3D; which may generate real-time view of thing around the device. The flash light is between the 2 camera of the iPhone, while other features remain the same. Many have suggested that iPhone 8 may reintroduce the headphone jack. However, this schematic showing no such changes at the bottom if examined closely. The top part of the iPhone 8 schematic indicates four separate points – Which is suggesting that iPhone 8 may have two camera on the front instead of one. iPhone 7 has a single front camera along with a light sensor. We believe that these four separate points means a dual front camera along with dual light sensors. We have already reported that Apple Inc. will be releasing three models this year on its 10th anniversary of iPhone. The two iPhone 7s and 7s Plus will be launched with similar design with upgraded features like better processor. However, the iPhone 8 model will be launched with curved OLED display and built-in home button. It’s rumored that the display screen size will be 5.8 inch. The built-in home button enables Apple to increase the display without altering the design. The iPhone 8 may cost you a bit more than usual iPhone’s. But, the built-in home button, bigger display without compromising the device size and a wireless charging feature will definitely worth spending some extra dollars. It’s highly suspected that iPhone 7s model and iPhone 8 model will have a similar size but, with built-in home button inside OLED screen iPhone 8 will have a much sharper and bigger display. The processor of iPhone 8 models will also be much better than iPhone 7s rumored to be “A11”. We will be bringing you all the latest news about iPhone 8. Stay tuned and do comment about what you think about Apple’s latest iPhone 8 features.